There are hundreds of way to enjoy salmon, but that grilled salmon marinade is surely one of the best. 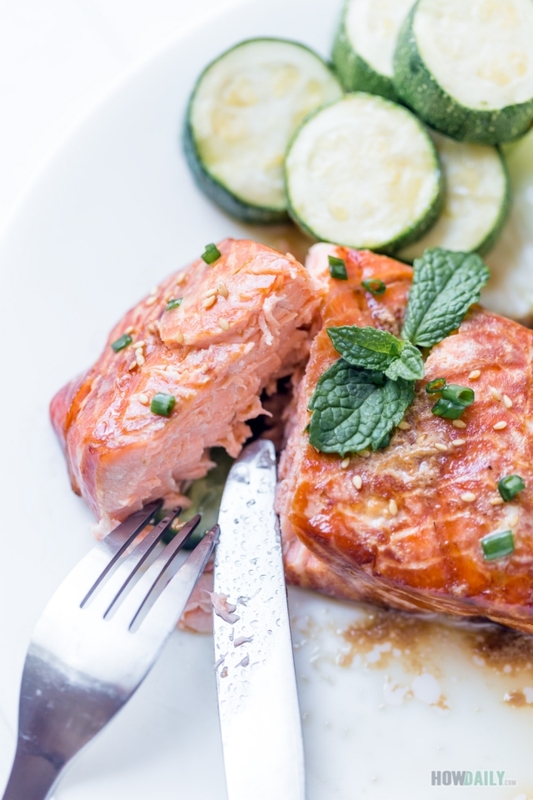 The savory flavor and beautiful brown of marinate salmon will surely make your dinner one to remember. Add grate ginger and garlic to spice them up, oh, and don’t forget the lemon season. 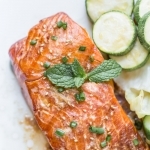 You could grill this marinade salmon on open fire or bake them in oven. Just make sure that you keep the skin on so that the salmon steak/fillet will hold its shape well together. Right before serve, you could remove the skin if that’s what you’re desired. There are a lot of different way to marinate salmon, like adding some sort of fruit, e.g. passion fruit and herb, but I found that honey and soy sauce do it perfectly. That is because they give out the brownish color, mild saltiness plus the soybean flavor will enhance salmon steak tremendously. Unless you’re using salmon belly, otherwise, it’s better to coat with some sort of oil to prevent drying on the surface. 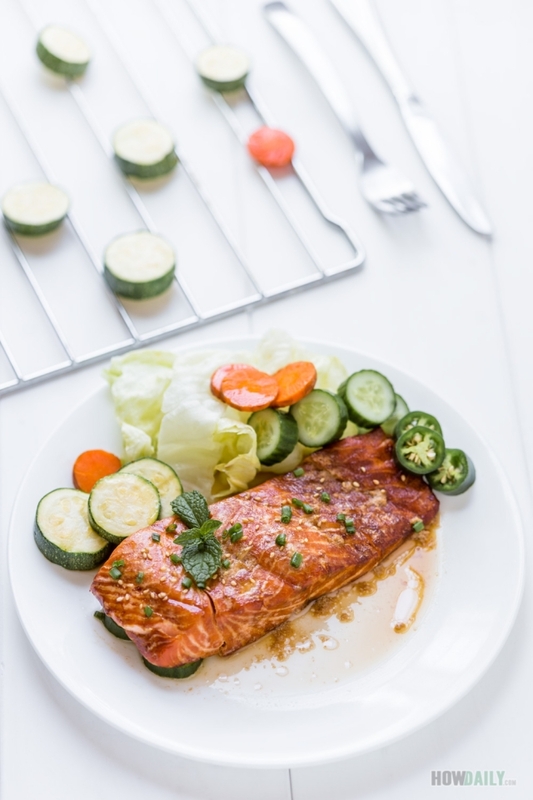 Marinated salmon with soy sauce and honey, an oriental flavor that will bring your salmon sizzling both on the grill and the table. Crush garlic then finely chop it. Make a mixture of 1 Tbsp olive oil, 3 Tbsp soy sauce, 1 Tbsp honey, crushed garlic and grated ginger. Stir the marinaded mixture well to mix, then add salmon fillets. Cover and marinate at room temperature for an hour or so. If you want more flavor to soak in, marinate longer, say 2 hours, but in fridge. Preheat grilled or oven tray. Lightly coat tray/grill grate with olive oil. 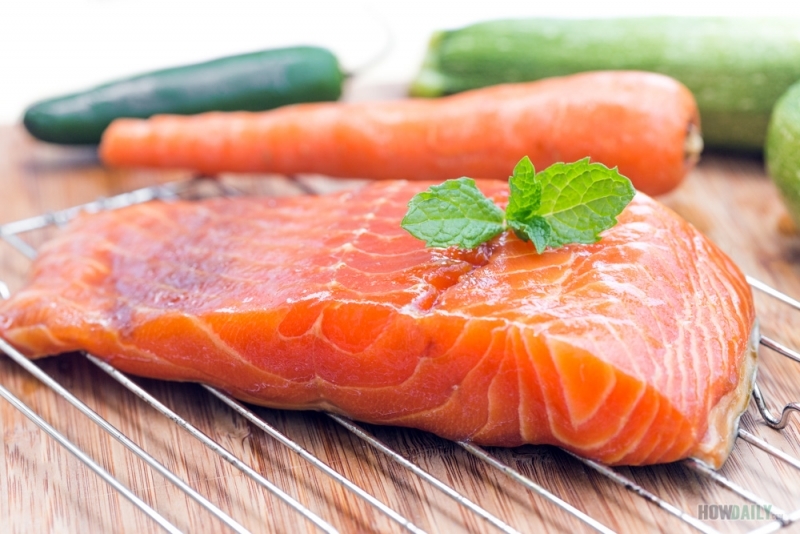 Place salmon on the preheated grill and cook salmon for 8 minutes per side or until desired time. In a small sauce pan, simmering the marinade with 2 Tbsp lemon juice until thick a bit. 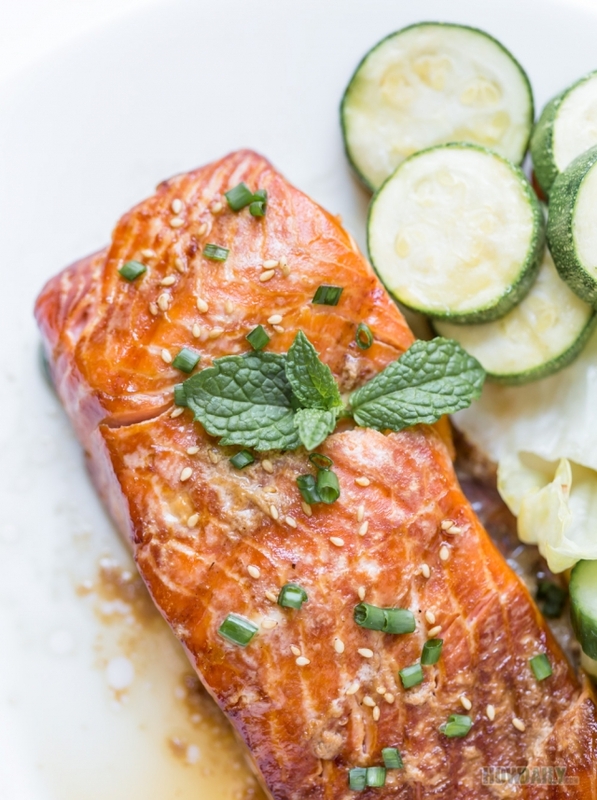 Use this sauce to glaze your grilled salmon when serve. Don't forget to sprinkle on some ground pepper if desired. Serve hot with grilled veggies and mac.